The mask worn by Luke Harper at WrestleMania 34 was created at the studio of horror movie special effects legend Tom Savini. Harper walked to the ring on Sunday with the top of his head covered by a gnarly animal skull. Alongside long-time partner Eric Rowan, he then went on to capture the SmackDown Tag Team Championship in a triple threat match against The Usos and The New Day. 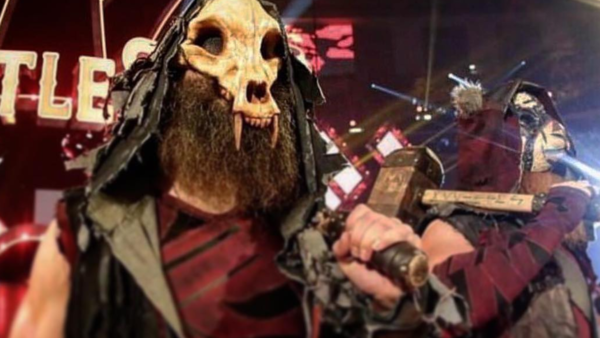 Savini posted a picture of the Bludgeon Brother's 'Mania get-up yesterday on Instagram, proudly revealing that it was sculpted and painted by members of his staff. It is reportedly one of several masks the company has been commissioned to make for him in recent years. The significance of this won't be lost on fans of the horror genre. Savini is well-known in these circles for his long association with the late, great George A. Romero, with whom he collaborated both as an actor and special effects designer on films including Dawn of the Dead and Creepshow. Savini also worked on several of the Friday the 13th movies, as well as the Texas Chainsaw Massacre sequel in 1986 - which is appropriate, given that Harper's own character strongly resembles a demented axe murderer.